In this update, Google introduces a lot of new features such as the addition of the material design, in-address bar answers to search queries, better tab management, and more. The most noticeable change in the iOS version though, is the moving of the navigation bar, which includes the back and forward arrows, a new search button, the open tabs button, and the menu button, from the top of the Chrome browser screen to the bottom as shown below. The only additional user interface element added is the new search button. This button is a bit redundant as it performs the same behavior as tapping in the address field at the top of the browser and was probably added to the bottom to keep all navigation behaviors in one place. As with any noticeable change in a popular program, users have been complaining that they do not like that the navigation bar was moved from the top to the bottom. 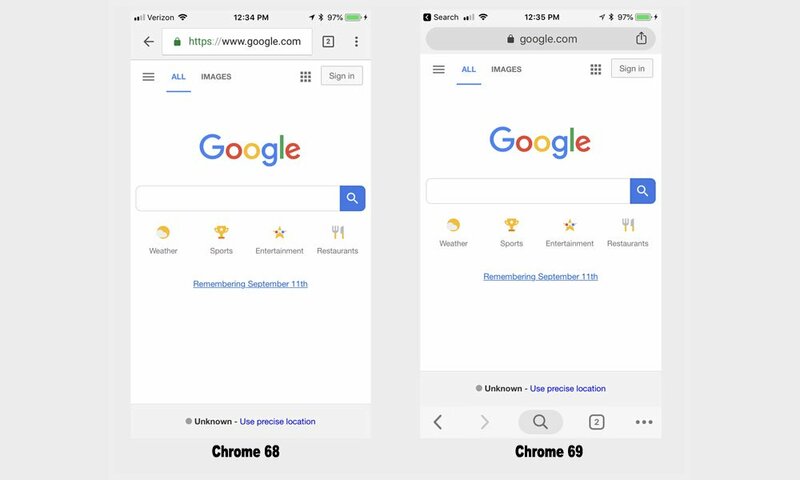 In many of the reviews, users are complaining that this change just makes Chrome look like Safari, which is one of the reasons they switched to Chrome in the first place. Others, though, feel that the changes make Chrome even better and that accessing open tabs is now easier. Google is not known to revert back UI changes even if users are unhappy. Therefore, whether you like it or not, if you wish to continue using Chrome, you are most likely stuck with the new UI.